As Ryan Blaney and the No. 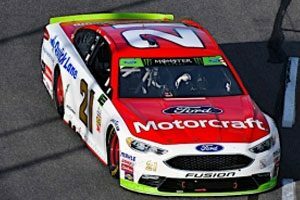 21 Motorcraft/Quick Lane team prepare for the second of three races in the Round of Eight in the Monster Energy Cup playoffs, the goal remains essentially the same as it’s been for every race this season. He’s earned stage points in five of the seven playoff races to date, and his 29 stage points earned in the Round of 12 played a big role in his advancement to the current Round of Eight. “The stage points are huge,” Blaney said during a media appearance at Martinsville Speedway. “They’re gigantic. Hopefully, we can gather a bunch of those, but I’m not really sure how many it’s going to take [to advance to the final round]. “You can probably run 10th in every single race in this round and not advance. Stage points matter. I think you’re going to have to get at least 12-15 stage points a race and finish inside the top 10 just to even have a prayer because the competition is so good right now. And Texas, a track that is similar to Kansas, has been good to Blaney as well as he swept both stages in April’s 500-miler. Qualifying for the AAA Texas 500 is set for Friday at 5:15 p.m. (6:15 Eastern Time), and the race is scheduled to get the green flag just after 1 p.m. (2 p.m. Eastern) with TV coverage on NBCSN.